Composites are a blend of resin (in this case mixed epoxy) and reinforcing fiber. Folks often ask, “How strong are they?” It is difficult to answer this question due to many variables including resin type, fiber type, fiber orientation, and resin/fiber ratio. To give a value for a laminate, we reduce the variables. Values shown in this article were done with test samples using WEST SYSTEM 105 Epoxy Resin®/206 Slow Hardener® at room temperature (70°F). Reinforcing fibers are Episize™ materials. Laminates made for the test had fibers oriented in one direction (unidirectional) and were laminated using simple contact pressure yielding consistent resin/fiber content (below). Laminates made for the test had fibers oriented in one direction and were laminated using simple contact pressure yielding consistent resin/fiber content. Test samples were prepared with inforced ends that could be gripped by our MTS test machine. Testing then exposed the samples to tension and compression. samples to tension and compression. Carbon fiber is typically produced in an inert environment at temperatures above 1,800°F. The process of producing carbon fiber accounts for its high price and classification as an exotic fiber. Carbon fibers are known for their light weight, high strength, and high stiffness. 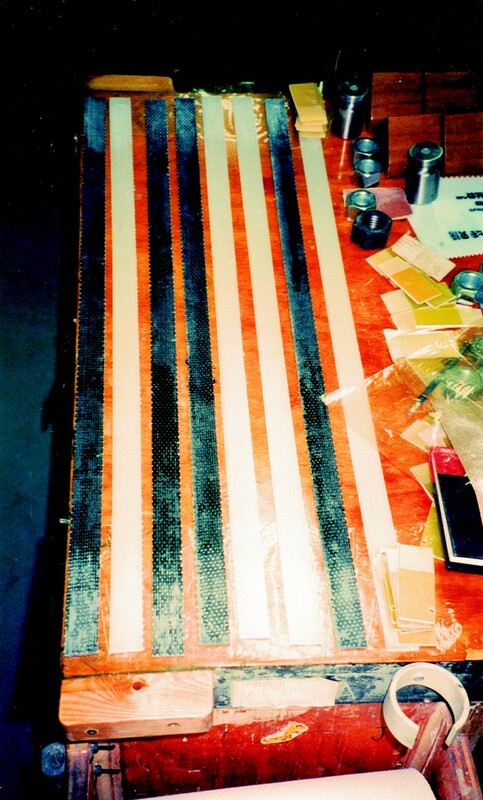 702 and 703 Unidirectional Carbon Tapes are designed to be used with WEST SYSTEM Brand epoxy. The hardener choice is dependent on laminate thickness (dimensionally), the time required to perform the operation, and ambient temperature when cure will take place. 702 and 703 carbon fibers are in tow form. A tow is like a ribbon. The tow of this material consists of 12,000 fiber bundles per inch of width, so it is referred to as 12K material. The tow is continuous, and unidirectional on the ‘0’ axis (along the tow length). The fibers are not twisted or woven. The white strands running on the 90 (degree) axis are polyester threads that hold the fiber bundles in place and are non-structural. This 12K material is on the order of 11 oz (per square yard) material and measures .025″ thick. Carbon fibers are electrically conductive and have a specific gravity of 1.75. When applying carbon fiber, assess the anticipated load path and orient the fibers in that direction. For example, a vertical flag pole is a cantilevered structure which is subjected to bending forces. Fiber orientation would be along the pole’s length to stiffen it. Carbon fibers are effective in compression or tension, but it’s best to apply fibers equally to both sides of a structure to maintain balance. 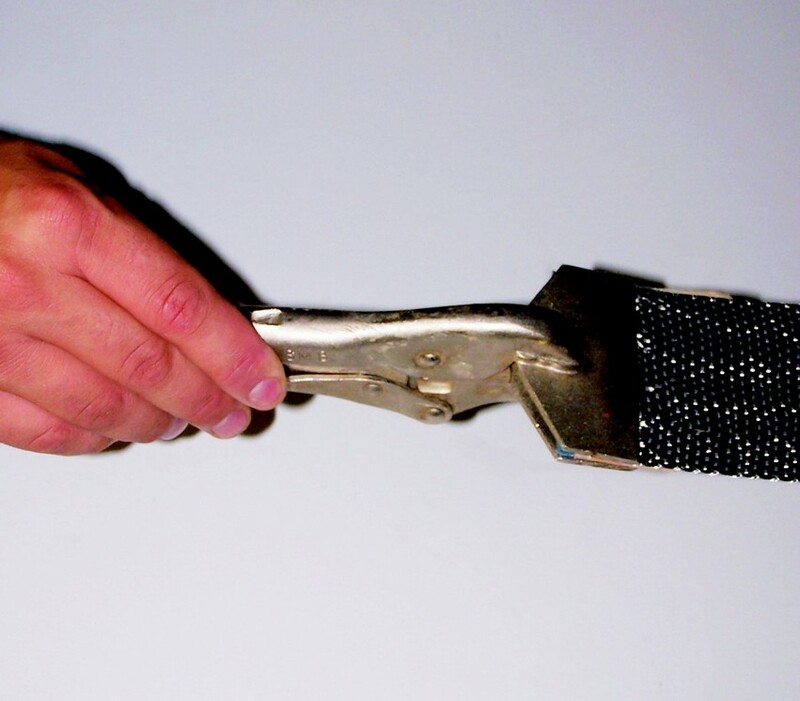 Carbon fibers can be introduced into wooden laminates, to augment between laminates, but they are most effective placed furthest from the neutral axis. Off-axis plies result in a rapid loss of strength and stiffness. A depression in a lay up (such as a wrinkle or bump) will attract forces and jeopardize the laminate. If off- xis fibers cross one another, it is best if the laminate is resin rich (on the order f 50%). A resin rich laminate helps keep the fibers from contacting each other, which we don’t want. Wet the substrate with epoxy. It’s best to place the first layer of carbon fiber into the coating while that coating is still wet as it will transfer best to the reinforcing fiber. Keep the fibers straight (in columns) as best you can. Locking sheet metal pliers with sandpaper adhered to the flange allows you to pre-tension as well as align the fibers precisely. When working with long objects, such as spars, we will cut our tape to length and attach the grips to both ends so the tape can be pulled taut and then lowered into position (below). Once they are in place, wet the fibers with epoxy using a brush and squeegee. Hold the tool at a low angle and thoroughly wet the carbon fiber. If the laminate requires more layers, continue to apply layers, wetting the fibers as you proceed. As a rule, don’t apply more than six layers at a time or you may experience excessive exothermic heat from the epoxy as it cures. 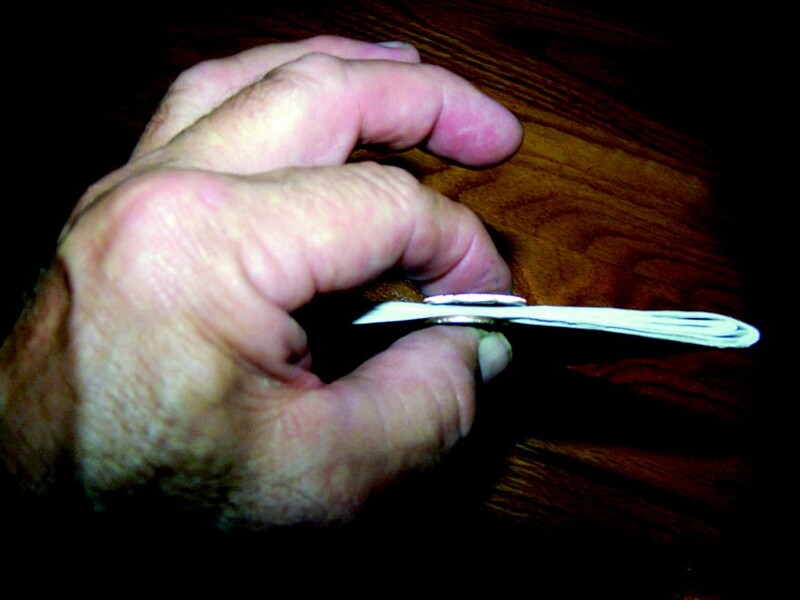 A method to determine how thick a laminate will be is to take a number of laminations (say four), place a coin on the top and bottom of the dry laminate stack and press lightly together with thumb and index finger. Offset the coins slightly (below). Pass a sewing needle through the stack until it touches the coin. Place a piece of tape on the needle on the other side of the laminate so you can measure the dimension. When all layers are applied, a good> approach is to place release fabric or polyethylene plastic over the last layer and squeegee firmly to remove excess resin and trapped air bubbles. Leave in place until the laminate cures. Remove the release fabric or plastic by pulling it back on itself as close to 180° as possible. Pull steadily and avoid jerking as you peel this film from the laminate. 713 Unidirectional Glass Tape is electrical grade fiberglass referred to as E glass. 713 fibers in tape form are continuous, unidirectional on the ‘0’ axis. They are not twisted or woven. The white strands running on the 90 axis are polyester fill threads that hold the fiber bundles in place and are non-structural. This material is on the order of 11 oz per square yard, measures .018 inches in thickness, and has a specific gravity of 2.54. 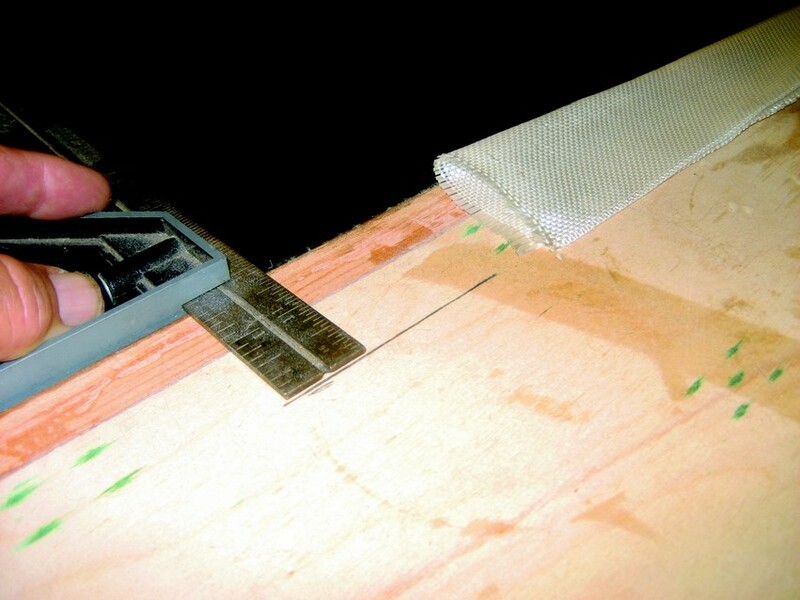 You would apply fiberglass tape in the same manner as described above for carbon fiber. Woven fabric tapes are electrical grade fiberglass that come in various widths: 729 (2″), 731 (3″), 732 (4”) and 733 (6″). They weigh 9 oz per square yard. These woven tapes have a selvaged edge that prevents fraying. Tapes are ideal to toughen and protect corners as well as for a myriad of other applications. Corners must first be rounded about like the radius of a dime (minimum) because the tape will not make the turn of a sharp corner. I take a short sample of the tape, fold it in half to find the center and then mark it. I center the mark over the apex of the corner. I then mark where the edges lie (below). Marking where the edges lie. Now, I’ll take a combination square and mark the two edges along the entire length of the corner (above). I wet the substrate between the marks with mixed resin/hardener along the entire length. Then I roll the tape, placing the edge on the mark and smooth it down. Usually, I’ll place just one surface (the easiest) down first. Once its entire length is in place, I press the remainder down. As the glass tape is negotiating the corner, it may not want to stay put. I’ve found if I just let it set for half an hour, the epoxy gets stickier as it begins to cure and then the glass stays down. I’ll re-wet the glass tape as required (it will be white if it is not wetted properly). When covering the corner of an arc shape, the edge may still not stay down. In these instances I’ll slit the edge, producing a dart, until it cooperates. I’ll wait a few more hours and then apply another coat to fill the weave of the tape as well as to inspect for wrinkles or bubbles which can be resolved at this time. 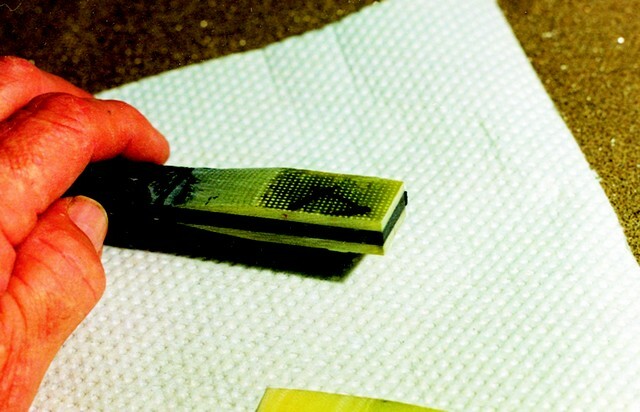 Sand the cured tape with 50-grit sandpaper on a sanding block to feather the selvaged edge. 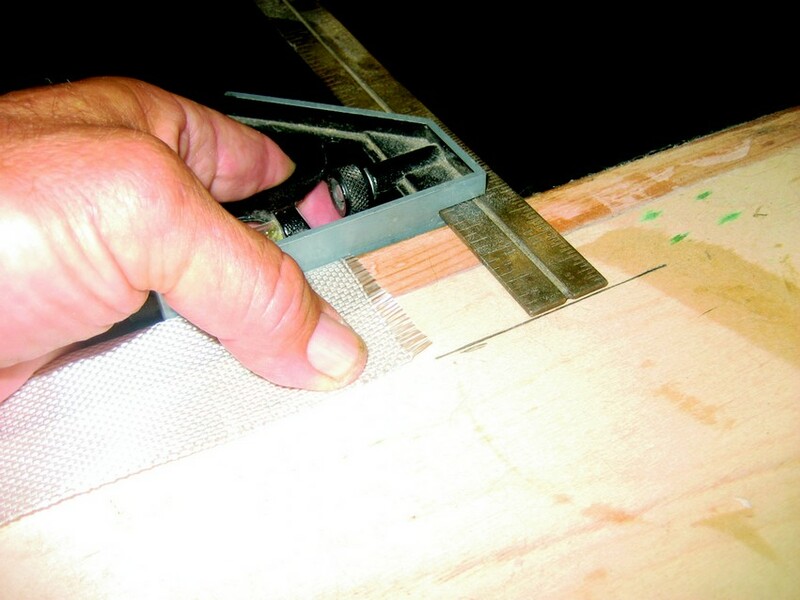 If the edge has got to blend, thicken a mixture of epoxy with 410 Microlight® and apply it with a wide putty knife. 727 Biaxial Tape is 4″ wide, 15 oz (per square yard) electrical grade fiberglass referred to as E glass. Biaxial is essentially two layers of unidirectional fiberglass placed 45° to the ‘0’ axis off the roll. The layers are held together with a light stitching, thus it is referred to as a stitched tape. It should not be confused with braid, which is woven. Biaxial has good utility as the strands are oriented to allow the tape to pass over a tighter corner. Biaxial is generally stronger on a per thickness basis than a woven fabric. 727 is .018″ per tow in thickness and has a specific gravity of 2.54. Woven tape has half its fibers taking the full brunt of the bend whereas with biaxial they pass as a more gradual 45° angle. However, Biaxial materials will take more filling with resin or fillers to finish smooth. *Poisson’s ratio is the ratio of the tranverse contracting strain to the elongation strain when a rod is stretched by forces which are applied at its ends and which are parallel to the rod’s axis.